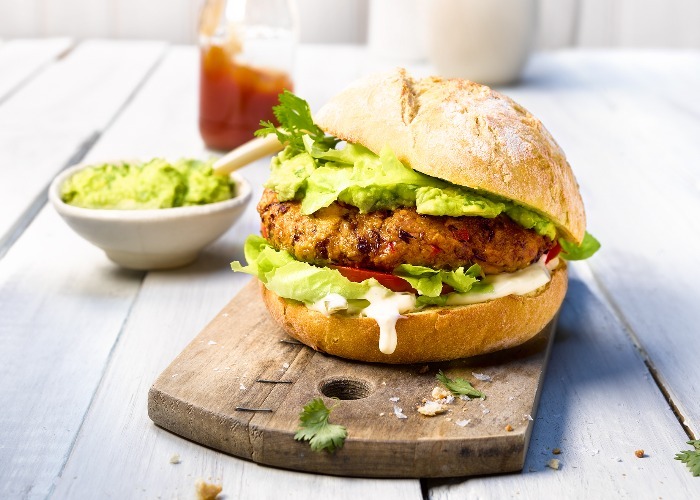 A hearty veggie burger topped with silky avocado cream, these sweet potato patties are a great alternative to meat. Peel the sweet potatoes, cut into chunks, spread onto a baking tray and bake for around 20 minutes, or until tender. Rinse the black beans with cold water and leave to drain, then purée in a food processor along with the cooked sweet potato. Set aside in a large bowl. Next, lightly fry the diced pepper and onion in a pan with 1 tbsp of the olive oil, adding the cumin and cayenne pepper towards the end. Add to the sweet potato and bean purée, along with the breadcrumbs. Mix well and add salt and pepper to taste, then set aside for at least 30 minutes to thicken. Skin and stone the avocado, and blend with the lime juice in a food processor. Stir in the crushed garlic, then season with salt and pepper. Pick the coriander leaves from the stems, chop finely and stir into the avo cream. Heat the remaining oil in a pan. Shape 4 patties from the sweet potato mix and fry on each side for 2 minutes until golden brown. To serve, thickly slice the tomatoes. Slice the jalapeños and mix with the mayo. Cut the bread rolls in half, toast, and spread the bottom half with the jalapeño mayo. Garnish with the lettuce and tomatoes, and add a sweet potato patty. Top with a blob of avo cream and place the other half of the bun on top. This recipe is courtesy of American Sweet Potato.